Like Spanish wine, olives and olive trees have a long and ancient history of cultivation in the Mediterranean area. The trees are said to have originated in Greece about 6,000 years ago, where stone tablets dating back to 2,500 BC have been found making reference to the plant. The Phoenicians and Greeks brought the olive tree to Spain and cultivation was further expanded under the Romans. The Arabs also continued to improve the technique of olive oil production during their rule. 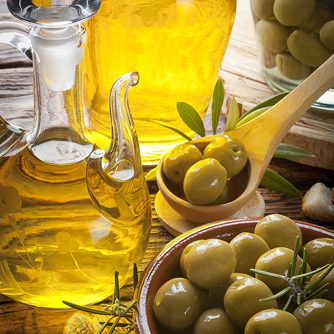 In fact, the Spanish word for oil, aceite, is derived from the Arabic word, al-zeit and “stuffed olive,” aceituna, also comes from the Arabic word al-zeituna. Andalucia is the largest olive oil producer in the world, which may be why I see it drizzled over everything, from toasted bread in the mornings to tapas at night. Catalonia, Castile-La Mancha and Aragón are also popular oil producing regions in Spain, each with it’s own unique and distinct flavor. Some oils from Andalucia are considered fruity, slightly bitter and peppery or with a touch of sweetness and piquancy from Aragón. Olive oil is a fundamental part of that Spanish diet and it also happens to be one of the healthiest oils in the world (why was I using vegetable oil…). Not only is it full of antioxidants and very easy to digest, it is also known to reduce and keep cholesterol levels in check. Although it is recommended to use virgin or extra virgin olive oil varieties to ensure you are reaping the benefits and getting this oil in its purest form. Until you can experience fresh, flavorful Spanish cuisine first-hand and savor their famous olive oil in it’s most traditional and purest form, you can always cook a Mediterranean meal at home. Here is a recipe for Salmorejo, a cold soup, very similar to gazpacho, but richer and smoother. Add some fresh rolls drizzled with olive oil along with a glass of Spanish wine and enjoy!